Why do mine disasters continue to occur in wealthy countries when major mine hazards have been known for over 200 years and subject to regulation for well over a century? What lessons can be drawn from these disasters and are mine operators, regulators and others drawing the correct conclusions from such events? Why is mining significantly safer in some countries than in others? Are the underlying causes of disasters substantially different from those that result in one or two fatalities? The vast majority of incidents entailed at least three of these pattern causes and many exhibited five or more. The book also demonstrates these pattern deficiencies are not confined to mining but can be identified in other workplace disasters including aircraft crashes, oil-rig explosions, refinery and factory fires, and shipping disasters. At the same time, the examination finds no evidence to support other popular explanations of mine safety which focus on behaviour, culture or complex technologies. It finds that there is little to differentiate the failures that lead to single death or multiple deaths and â€˜disasterâ€™ studies would benefit from also examining near misses. The book examines why pattern causes have proved so resistant to intervention by governments while also identifying instances where lessons have been learned. How, for example, do governments strike a balance between prescriptive regulation and risk management/system-based approaches? Only by understanding and modifying the political economy of safety can these problems be addressed. It concludes by proposing an agenda for change that will address pattern causes and contribute to safe and productive work environments. 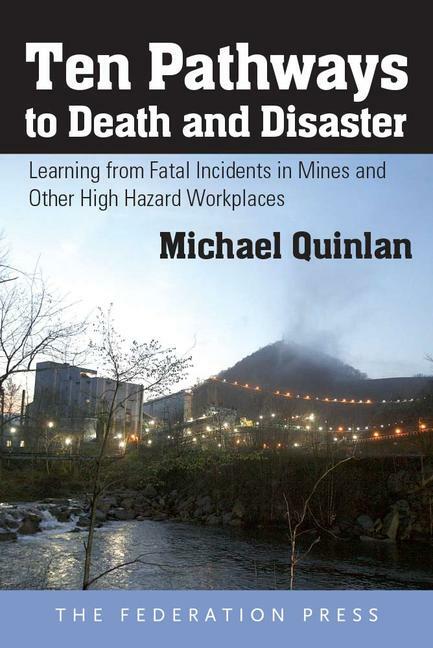 The book is written for those studying OHS, mine safety and risk management as well as those involved in the management or regulation of high hazard workplaces. Michael Quinlan, PhD is professor in the School of Management at UNSW where he teaches occupational health and safety (OHS) and risk management. He is also an honorary professor in the Faculty of Health Sciences at the University of Sydney and an adjunct professor in the Business School at Middlesex University, London.